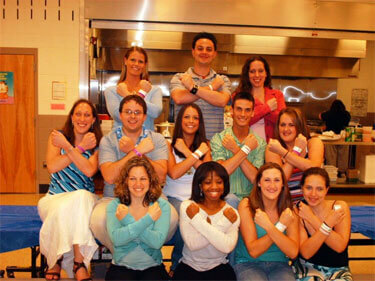 This picture is from Leighann Fields, a member of Bpex winter guard from 2001-2006 and Crossmen from 2004-present. This is a picture from the TIA (Tournament Indoor Association) Championships in Wildwood, N.J. All these people are members of both Apex and Bpex winter guards that are either current or past Crossmen members. Top row: Alicia Briggs (01), Stephen Howard (03), Sarah Novick (03). Middle row: Lori Schweiring (04), Chris Cromwell (01-02), Holly Stover (04-05), Kevin McKeeman (04-05), Leighann Fields (04-05). Bottom row: Christine Barden (00-01), Nikki Roy (92), Steph Mullen (05), Andrea Reedy (05). Holly, Steph, Kevin, Andrea and I will all be marching again in 2006. This past weekend in Wildwood, Apex placed third in the Independent World Class, and Bpex placed second in the Independent Open Class.